Now that “The Ultimate Fighter 14” is officially yesterday’s news, the UFC has efficiently gone about filling out the roster for the show’s Finale this Saturday in Las Vegas. As expected, the 10-bout lineup is filled with TUF 14 contestants, including Roland Delorme, who served as 5thRound.com’s exclusive blogger throughout the season. Of interesting note, Akira Corassani did not receive an invitation to the party. The controversial featherweight created quite the ruckus inside the TUF house, which sometimes spells an opportunity with the UFC even if you don’t win the tournament. The Pearl at the Palms Casino Resort in Nevada will host the shindig. 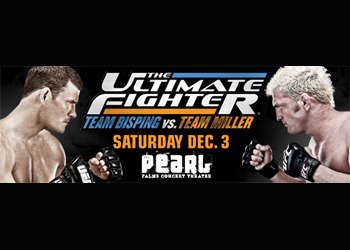 Michael Bisping and Jason “Mayhem” Miller, the opposing coaches from this past season, headlines the festivities. Spike TV broadcasts the main card live starting at 8PM ET/5PM PT. Although no official announcement has been made, the UFC’s Facebook page is expected to provide a stream of all the preliminary fights.